Grundfos circulator pumps are designed for residential and commercial heating and cooling systems and for domestic hot water systems. Their wet rotor design ensures quiet, maintenance-free operation. Pump Express is a stocking distributor of Grundfos circulators including the popular ALPHA, MAGNA, MAGNA 3v, UP Series, VersaFlo UPS Series and VersaFlo TP Series. Quiet, maintenance-free performance, low energy consumption, versatality and long life are the qualities that make Grundfos a leading circulator pump manufacturer. 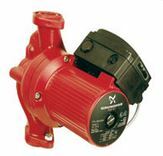 Call Pump Express Today at 1-800-298-4100 for Low Prices and Fast Delivery on Grundfos Circulator Pumps.